March 18th was an important day of protest against the catastrophes of the European politics of impoverishment. Thousands of people participated in the blockades in the morning, 25.000 came to the rally and demonstration in the afternoon, and all this in the middle of the week, as a big transnational mobilization. This made #18M a clear sign of strong resistance against the crisis regime and for another Europe of solidarity. Protest and resistance in broad alliances are now needed more than ever, especially in the country advancing the disastrous crisis policy. At the same time, strong criticism was raised publicly and within the diverse groups, networks and organizations of the Blockupy spectrum regarding some actions that took place in the morning. Thus, in its ambivalence the action day poses important questions for us, which we will face. After March 18th we started with a thorough evaluation of our actions, within the entire Blockupy spectrum and the coordinating group, at the activist meeting in Berlin and in the context of Blockupy international. This thesis paper picks up on this discussion and invites the movements to find agreements in order to be able to take new steps. Blockupy has by now also become a transnational platform for joint mobilization against the crisis policy. All theses, which the coordinating group hereby puts up for discussion, therefore always have a Europe-wide dimension of “Solidarity beyond borders“. 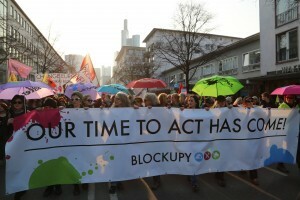 Blockupy consists of very different, left actors, all have their own projects. We differ in our experiences, political practice and positions on forms of actions. This also applies to militancy and militant actions, which we perceive and understand differently. Our assessments of the course of March 18th – also within the different actors of the Blockupy spectrum – are in parts vastly diverse. Together we decided to have a diverse left, disobedient and transnational alliance against the crisis policy and we refuse to accept the simple categorization into “militants” and “NGOs/ parties”. Given the current situation in Europe and Germany and from a position of marginality, for us Blockupy is about finding steps for societal intensification and not about identitarian self-assurance of its actors. Blockupy will take new steps and change in the course of it. The task we face is to continue to establish practical cooperation while being aware of our differences. With Blockupy we are striving for broader social involvement and political intensification. Therefore, we want communicable forms of civil disobedience, which allow for a broad participation both within and outside the alliance, which transgress the rules of what is allowed more than just symbolically, thereby producing strong images: people break rules, because it is about something much more important. Disobedience polarizes, leads to repression, and makes cracks in the concrete visible. It shows the violence and arrogance of those in power, our living conditions and the vibrancy of our resistance. We want to call for masses of people to cross boundaries. We do not celebrate the radicalism of activists but encourage the new ones and are guided by the possibilities of all within the alliance. We want to find images, which are imaginative and communicable, instead of following the language of those in power. Together we practice to disobey and to protect ourselves from attacks. We do not claim absoluteness for our form of action, in other contexts the forms of action of all actors of the alliance are different. In light of the social power relations in this country, we are convinced that our joint political decision for a left disobedience that is capable of forming alliances and that is communicable still is strategically required and politically important. In broad left alliances identitarian attitudes towards disobedience are not possible. We do not position ourselves on forms of actions in general but reach agreements for our alliance. However, these must be reliable, because this is the only way to secure the broadness of the alliance and because we have to assume responsibility for our mobilization (“We say what we do and we do what we say”). Reliability of agreements develops within collective action and planning. Consensuses remain nothing but papers once actors of the alliance adhere to the texts but do not participate in the action or once others mobilize and act without identifying themselves with the agreements. We invite all activists and groups also outside the alliance, who respect our consensuses, to actively participate in our actions. As organizers we cannot and of course do not want to demand that all activists within a whole city must adhere to our decisions. From our perspective, it comes as no surprise, is even desirable, that on a day like March 18th different parts of an emancipatory movement, which is larger than our alliance, also politically define and carry out own actions. However, in order for strength to arise from this vivid and unpredictable diversity, the willingness of all actors to communicate with each other and to find arrangements is a first precondition. Practically all blockades by groups of the Blockupy alliance were disobedient, bold and determined actions, from which no escalation arose. Thousands of activists participated, which is a great success. If we failed to shape the action day and its images in the way we had planned in long and collective processes, there are several reasons for it. One one hand, at some points of the blockade we were not organized and well prepared as would have been necessary in order to actively shape the actions. Sometimes, facilitation and communication and with this transparency on the situation was missing. At some points, planning and determination were missing in order to counter the “high-security zone” with our own, creative images. We reflect this self-critically and learn from this for future actions. On the other hand, political actors deliberately used places of our actions to stage their political agenda, contrary to the choreography which had been prepared and agreed upon by many activists. We consider this as a lack of communication and solidarity. Beyond the question of how different actors of our alliance position themselves with respect to the images of March 18th, the important questions and tasks for us now are: how can we more actively seek dialogue before actions? How can we create conditions in which we are able to determine our own actions politically? We always said that we would stand in solidarity with other forms of actions. However, we also demand this solidarity for our actions. And we believe that every decision to actively participate in a disobedient action deserves the same respect. Collectively determined political actions must be realizable and should not be ignored by others or made impossible by the individualistic “everyone can do whatever they want”. Of course, it is understandable to deliberately decide against alliances and to politically reject their non-escalating consensuses. But those who massively escalate from the protection of these alliance actions turn the alliance and other activists into pure objects of their political actions and thereby do not act in solidarity. We cannot and do not want to accept this. We are still convinced that communication and solidarity are the most important answers to this problem, which is why we explicitly call for the whole left political spectrum to enter into dialogue with us on this topic. We were and still are in the unpleasant situation of having to comment on actions, which we did not plan or carry out. We criticized some of these actions in the morning of March 18th as neither responsible nor communicable. At the same time we refuse the ritual of “distancing” which is demanded of us (as the termination of contacts in the interest of those in power and the legitimization of police violence against other activists). This has placed individuals from the alliance and Blockupy as a whole under enormous political and media pressure. We criticize the grave attacks by the police on March 18th and reject all cynical attempts to abuse militant actions in order to depoliticize crisis protests, to criminalize civil disobedience and to further undermine the right of assembly. Together with many other actors we cannot take the inhumane politics of impoverishment anymore. Everything we are saying here is the opposite of “silence in the country”, of a “resistance within law and order limits”, which those in power would like to have. In the face of growing social inequality we are concerned with the conditions of widespread resistance and socially contagious unrest. It is about making a difference. How to continue? We perceive mass disobedience in alliances as a left space of action, as an important option also for other conflicts, such as NoBorder, right to the city, climate or anti-nuclear energy struggles. We want Blockupy as a broad, disobedient, transnational alliance. We need reliability and communicability, in order to reach a lot of people even beyond the alliance. We want to take all parts of the left as political actors seriously, to discuss with all groups involved on political and strategic questions and – more than before – to make arrangements. The essential and indispensable basis for this is mutual solidarity.